We propose here a one-pot synthetic approach to prepare sol–gel graphite electrodes containing gold nanoparticles (AuNPs). At variance with the traditional synthesis, in which AuNPs are prepared in advance with respect to the silica matrix, they were here obtained directly inside the sol–gel, during its formation. Two reduction methods, namely chemical and thermal reduction, were used to achieve AuNPs starting from a suitable gold precursor, either consisting of NaAuCl4 or HAuCl4. Different experimental parameters were tested in order to direct the synthesis of the material to the characteristics sought, namely Si/Au molar ratio, graphite (g): silane precursor (mL) ratio, chemical nature of the gold precursor and of the reductant, duration and temperature of thermal treatment. Sol–gel was prepared by means of sonocatalysis, in order to reduce the amount of solvent and time necessary for the hydrolysis step. 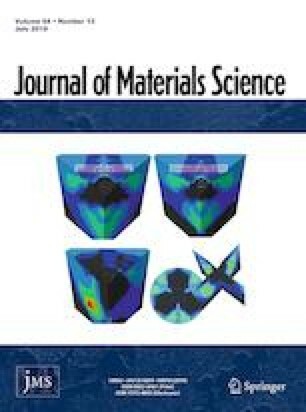 Composition of the material, as well as shape, size and distribution of AuNPs inside the silica matrix was evaluated by spectroscopic and microscopic techniques. Furthermore, electrochemical tests allowed us to ascertain the good conductivity of the composite material and the electrocatalytic activity of AuNPs with respect to glucose and ascorbic acid oxidation. These tests demonstrated that the electrodes obtained by thermal reduction show the best performance in terms of sensitivity for the detection of these analytes, suggesting the possible application of this composite in the field of amperometric sensing. The online version of this article ( https://doi.org/10.1007/s10853-019-03580-y) contains supplementary material, which is available to authorized users. This research was financed with funds from the University of Modena e Reggio Emilia, (Project FAR 2015, “Sviluppo Di Materiali A Base Silicatica Per Applicazioni Sensoristiche” Decreto rettorale n. 267/2016 Prot. n. 81676 del 28/06/2016). Authors also thank the “Centro Interdipartimentale Grandi Strumenti” (CIGS) of the University of Modena e Reggio Emilia for instrument availability and assistance.